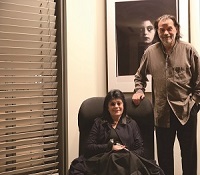 The Gene and Brian Sherman collection of contemporary art from Australia and the Asia Pacific mutates constantly – branching out recently into South Asia and the African continent. In keeping with the collectors’ desire to refresh and refine this body of work, which still comprises pieces inherited from their parents, this fourth Deutscher and Hackett Capsule gathers together works that individually and collectively give expression to the contemporary. Landscapes (Philip Wolfhagen) and references to country (Prince of Wales) speak to our need to respect and retain precious wilderness as urban populations expand exponentially worldwide; war, an ancient and sadly ongoing contemporary condition is evoked in eX de Medici’s helmet references to the USA and Vietnam; our present day focus on individuality and the (oft unsettled) body finds a voice in photo media work by Petrina Hicks, whilst the Latvian and Maori backgrounds of art stars, Imants Tillers and Shane Cotton, signal the multifaceted reality of Australasia and the globalised world. Of the moment topics include the complexity of sexuality (Juan Davila) and extreme individualism (Gareth Samson). In summary, this mini collection of Australian artists visually explores a range of topics that take the temperature of our times. Each work, thoughtfully acquired and cared for appropriately, has played a role in a carefully curated half century of collecting. It is time now for us to let go, to say farewell to these special works – and to move into new explorations of contemporaneity. Change is life’s constant and keeps us curious, young in spirit and connected to current realities.